Have you ever been challenged? Sometimes challenges are great. They motivate. Then there are those challenges that make our heart stop. Make us sweat with fear. Like the challenge Jeff Goins posed today as part of his 15 Habits of Great Writers challenge. Jeff recently released a new e-book called You Are a Writer (So Start Acting Like One) (affiliate link). What makes this book great is its accessibility to all industries. Essentially, the book helps you realize that if you want to be a writer, than say you are. This is true for many other professions, especially leadership. If you want to be a leader, than say you are – and start acting like one! To build on his book, he started a series called the 15 Habits. As you can guess, day one’s challenge: DECLARATION. Well, that’s not so bad. I mean, I say on my About Me page that I’m a writer. I’ve declared it. Heck, I’ve even shared it with a bunch of strangers on Twitter. That for sure is declaring it. I recently attended a “Netweaving” event hosted by the YWCA Women’s Leadership Program. (This event was set up like speed dating, but instead, we met some of the leading women in our community and had to share our elevator speech.) 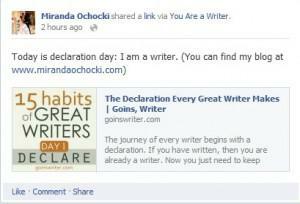 In it, I said “Hi, I am Miranda and I am a writer and public speaker.” So I know that I’ve declared it. Then why did my heart start racing when Jeff gave that challenge? Ok, I know. Silly right? Well, here is the deal. Facebook is one of those places where your real friends are. Those who knew you as a child. Those you went to high school with. Those who you’ve worked with. Those who know the real you. Phew. Who is the real me? So Jeff’s challenge made me rethink who I am being. And who I am being it for. I’m very upfront about my faith. I LOVE GOD and I would shout it from the rooftop (or, say it on Facebook). But I can’t share my blog in fear of judgment? Question: Have you declared anything recently? Let me know how it went! Leave a comment below! Thanks for reading! Don't miss any of my updates. Join my community - it's free! Let's keep the conversation going! Share your thoughts with me below.